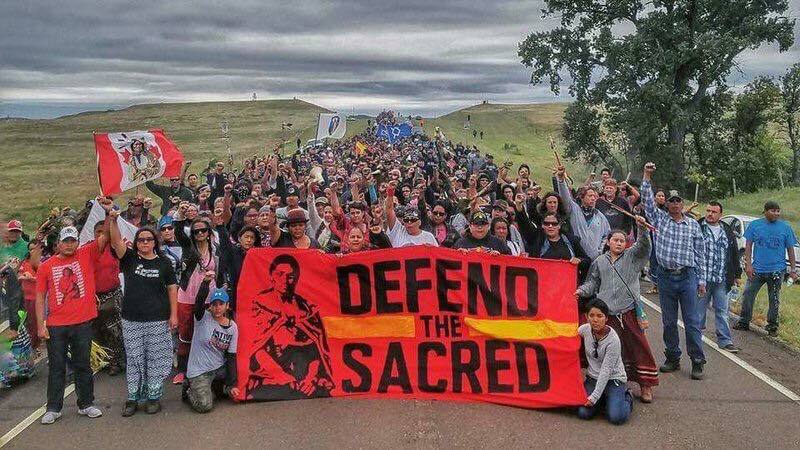 Standing Rock Sioux Tribe Records of Official Organization, City, and Business Support) Note: Most city events are listed on the Solidarity Events page. Both of these pages have records of events. Coalition of United States Mayors letter to President Obama. 11/15/16 Lots of wonderful people got together to stand in solidarity with Standing Rock in Center City Philadelphia. We visited the Army Core of Engineers office and a couple of banks all while circling around City Hall. 12/1/16 Thank you Minneapolis water protectors for taking action! Lock-down happening NOW at Minneapolis Wells Fargo Corporate Headquarters. 12/1/16 The International Indigenous Youth Council is at an indigenous let action in Wells Fargo in Minneapolis today! 12/1/16 Thank you brave water protectors in Minneapolis, an Ogla brother Pine Ridge togehter with an ally have shut down Wells Fargo on Franklin Ave. .
12/1/16 Thank you brave water protectors in Minneapolis, an Oglala brother from Pine Ridge together with an ally have shut down Wells Fargo on Franklin Ave. Police have just started to block the view of supporters as Minneapolis Fire Department attempt to cut out our relatives! 2/18/17 Honoring our Grandmothers: An Indigenous Womens Gathering. Cheyenne River Indian Reservation on 2/18-2/19/17. 2/16/17 Resolution to divest from the DAPL banks to be introduced tonight at Providence, RI City Hall. The FANG Collective. 2/21/17 Sammamish for Standing Rock Event. "The City of Sammamish does their banking with Wells Fargo,...we in Sammamish should build off of Seattle's success and pass a similar Ordinance [to divest their budget from DAPL]." 8/24/16 St. Paul: Expressing solidarity with Indigenous Resistance to the Dakota Access Pipeline.